Starting the process of turning where you live into a smart home can be intimidating. It can be difficult to know which products you’ll need to get started, and the prices can feel daunting. 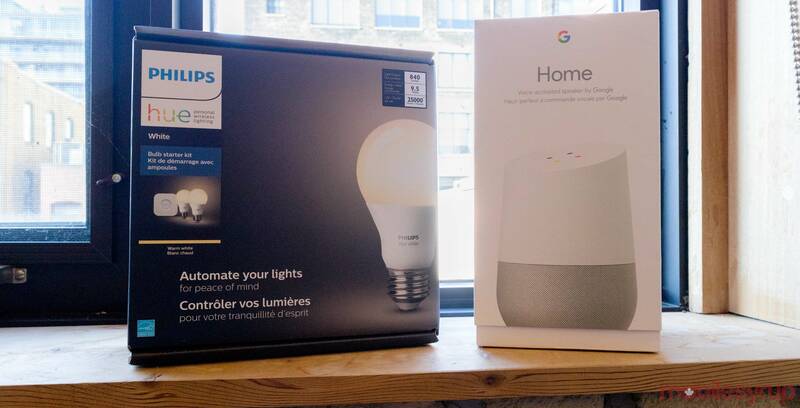 So save your hard-earned money and enter our contest to win a Google Home speaker and Philips Hue white A19 smart light bulb starter kit — valued at a total of $249 CAD. Google Home can answer questions, find your smartphone, relay weather forecasts, help you get dressed and even use an assortment of Telus Actions, which allows you to check your phone bill in detail, adding data or a roaming pass and send text messages. To learn more about Telus Actions, visit the carrier’s website. Another useful smart home product is the Philips Hue A19 starter kit. With the Google Home and Philips Hue combination, you can turn off and on the lights in your home without moving. “Hey Google, turn on the game room lights.” It’s easy as that. With the Philips Hue lights, you can also dim the lights and set a schedule, so the lights turn on at specific times. To enter the contest, all you have to do is follow us on Twitter, Facebook, Instagram or YouTube and leave a comment tell us what you like most about the Google Home. Telus carries a variety of Google’s latest products, including the Google Home, Home Mini and the Home Max.